Sym is officially described as a playable exploration of the symptoms of social anxiety disorder (SAD), and that, even more so than its interesting art style and game mechanics, is what compelled me to review it. Having grappled with the disorder for my entire adolescent and adult years, I consider it my duty to provide an experienced perspective on the game’s allegory. And here it is: Sym’s depiction of social anxiety is hit or miss, but when it hits, it hits hard. The gameplay that carries its message is similarly messy, featuring plenty of clever mechanics that are ultimately let down by surprising complexities that the game’s indie scope could never hope to tame. It stars a teenager named Josh, although it never shows him directly. 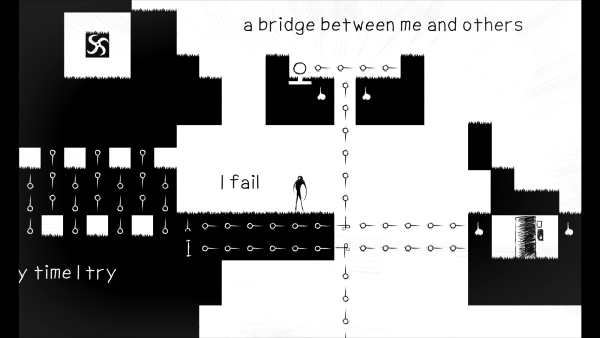 Instead the game focuses on Caleb and Ammiel – alter egos unconsciously created by Josh in the first of several broad abstractions the game makes regarding its subject matter. Caleb is a stylized human attempting to integrate into society. To represent the discomforting and dangerous worldview SAD sufferers often hold (where the mere presence of others can feel psychologically damaging), Caleb’s view of reality is inhabited by monstrous eyes and amorphous creatures, the latter of which threaten to devour him upon contact. Ammiel is a more alien form that hides in the walls of Caleb’s reality, encouraging Josh to abandon human contact altogether. In Ammiel’s world, the aforementioned eyes are always closed, and the creatures are powerless, but spinning razors become equally threatening. The razors, which presumably represent the depression that SAD often leads to, are the first gut punch the allegory really connects with, immediately showing that the game will not be tiptoeing around its theme. The idea of the game’s “light” and “dark” worlds existing within one another is certainly an interesting twist on standard dual-world gameplay. At first, interplay between the two alter egos is minimal; almost every early puzzle is solved by receding into the ground as Ammiel and using what was empty space in Caleb’s world as a platform to reach the exit, mirroring the avoidant behaviour of SAD sufferers prior to treatment. However, as the game progresses, the two identities work together more and more, presumably in correlation with Josh overcoming his anxieties while simultaneously accepting that occasional introversion is healthy and normal. This metaphorical gameplay is easily the game’s biggest narrative strength, but, when mishandled, it becomes its biggest weakness as well. Brilliant as its basic mechanics may be, Sym can’t seem to keep its own interpretation of them consistent. Binary systems are a recurring theme, and not just because of the light world/dark world paradigm. Switches display their positions with ones and zeroes, the ability to generate platforms governed by Boolean operators (“and”, “or”, and “not”) is a common puzzle-solving mechanic, and one puzzle even requires spelling out a given number in base-2. But SAD is not a binary system; it doesn’t get turned off following treatment, it just diminishes. For a while, it seemed Sym understood that, what with the gradual balancing of Josh’s thought processes. Caleb’s and Ammiel’s designs even evoke Yin and Yang – common shorthand for “opposing but inseparable”. However, that understanding is called into question near the end, when players are asked to choose which identity’s advice to follow wholeheartedly, which determines what the last few levels will be. Not only is that not how SAD works, it’s not how the game’s mechanics work, since players must continue to use both identities even while they’re supposedly abandoning one. Contradictions like this appear throughout the game, making me wonder how many of its high points exist by accident. 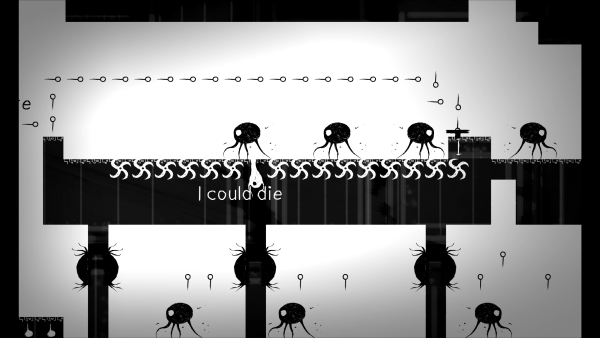 Some are almost definitely deliberate; one level contains a second exit that’s completely inaccessible but accompanied by text taunting the protagonist, perfectly capturing the maddening “I should be able to do this but I can’t” thought process of SAD sufferers. But elsewhere, the snippets of text that dot the setting alternate between pointed remarks and vague, sobering verse, as if the writer was just throwing darts at a wall of generic depressive phrases, hoping something would strike a chord. The platform-generation mechanic is another good example. Sometimes the terrain created is an oppressive force emitted from the general vicinity of an antagonistic eyeball, symbolizing Josh’s overpowering anxiety, and other times it’s just…ground, used to get from place to place. But what if you don’t care about the metaphor and just want to play a gloomy puzzle-platformer? Well, Sym’s intricate design will certainly keep you interested, but there are still better options even within that narrow category. Despite its original mechanics, the game will feel very familiar to fans of artsy browser-based platformers like The Company of Myself or Time Fcuk. The levels are brilliant from a design perspective; whoever was in charge of weaving together so many sprawling webs of Boolean-controlled terrain is clearly a genius in their field. They’re not particularly intuitive for the player, however, so there’s an unfortunate element of trial and error involved in figuring out where terrain will grow before it happens. The levels are also filled with unnecessary details that obscure the intended path. These elements might symbolize the way SAD sufferers have to discover their own lifestyle balance in order to function, but that explanation might be stretching the metaphor a little too far. The game also features the level of technical polish one would expect from a game whose closest peers are Flash projects. While the jumping controls are fluid and generally forgiving, the hit detection is very spotty, making it easy to get caught on corners and forced to mash arrow keys to escape. Interacting with terrain generators can be a nightmare for this reason; a moderately common cause of death in Sym is getting stuck inside a chunk of rock…or being launched across the room by a chunk of rock that just popped into existence. Finally, the level editor is nearly broken, featuring an unresponsive interface and several elements that simply don’t work at all. The game wasn’t exactly begging for a level editor, so it shouldn’t matter too much, but it does render another advertised feature – the ability to link the exits of your designs to other user-made levels – completely irrelevant. If it wasn’t already obvious, Sym has a habit of starting strong and then stumbling just short of true quality. This pattern continues into its aesthetics. The gangly, wobbling animation and monochrome palette are successfully touching the same unsettling nerve that Limbo latched on to, but unlike Limbo, Sym isn’t very adept at conveying things visually. Part of the reason the terrain-manipulating puzzles are so difficult is because the symbols involved are so minutely different that it’s hard to tell what they’re going to do. The soundtrack is, predictably for a somber indie title, a series of piano-driven dirges. Ammiel’s sections earn points for suitably cloaking the music in a muted shroud, but some of the “light world” songs are undeniably upbeat even when their gameplay accompaniment is as disturbing as ever. Fittingly for a game that keeps dividing its presentation into false dichotomies, Sym seems kind of two-faced. It wants to manifest a real psychological disorder within its constructed world, but it also wants to explore that world using poorly-planned game mechanics that ultimately unravel the metaphor. Furthermore, the overwhelming negativity of the presentation makes it difficult to shake the feeling that it was designed solely to vindicate the feelings of victimization that SAD provokes. After all, the allegory is too inconsistent and abstract to teach an ignorant player about the disorder, so the only reason for the layman to play the game is to experience a straightforward puzzle-platformer. And while Sym isn’t bad in that regard – it’s got decent puzzles and atmosphere, plus ambition to spare – it’s outshined by the very games that seemingly inspired it. With all of these “indie” games filling the online market, it’s easy to forget that while these games are made by small teams and not owned by a bigger company, there are also indie games that are published by the development team themselves. In the case of Tiny & Big in Grandpa’s Leftovers, we see that can be both great and not-so-great.